Amy of Gone INKognito posted this card on her site awhile ago. I LOVED it, and filed it away for inspiration. When I was getting ready for this month's Stamp-A-Stack, I thought, "What would that card look like in spring colors?" Since there are many colors in the Bold Brights family that are being retired at the end of June, I thought I'd start there to give this card a makeover. There is card stock to be used up before the deadline, and I want to make the most of what I have. I started with a Gable Green base and cut 1.75" squares of YoYo Yellow and Only Orange and Whisper White. I used White Craft Ink on two images from Pocket Silhouettes and embossed them with White Embossing Powder. I don't have the curvy label punch that Amy used for her central image, so I pulled out my "kisses" diecuts from the recent Occasions Mini Catalog and cut a portion of the diecut away to make it less dominant and more interesting visually. 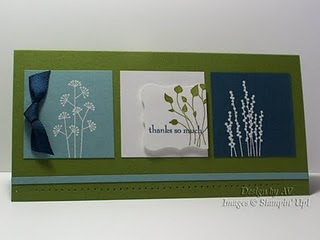 Then I pulled out a strip of Green Galore, also from Bold Brights and also retiring, and used my new Scallop Border punch, which will be carrying over from the Occasions Mini into the upcoming 2010-2011 catalog that releases July 1, to create an interesting border. Sort of makes you think of an ornamental border you place in a garden to keep the grass out, doesn't it? If it doesn't, humor me! I like this fresher redux, and I hope the stampers at this month's Stamp-A-Stack do also! This month's event is scheduled for Friday evening, April 23, and Sat. morning, April 24. If you're GA local and want to attend, just leave a comment and I'll get you details! Now, for a bit more information about the colors affected by SU! 's Color Renovation. 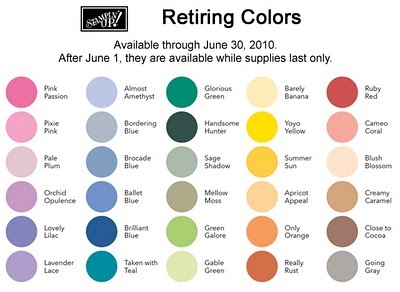 There are a total of 40 colors that SU! has deemed are no longer current, so we'll be saying farewell to them at the end of this big idea book & catalog season. If you see any here that you want for your stash, be sure to order online through my online store as soon as possible. They're available while supplies last, as they say. a georgia blogger! good to find ya! SU! Starts a REvoLuTioN with Color Renovation!